The storybook setting and amorous ambiance of Walt Disney World Resort has lovebirds flocking to the Vacation Kingdom for a romantic getaway. Moonlit strolls, luxurious spas and intimate dining make it feel like Valentine’s Day every day. Couples who’ve been bitten by the love bug don’t need a fairy godmother to find romance at Walt Disney World Resort. This is, after all, home to some of the world’s most famous romances: Cinderella and Prince Charming, Lady and the Tramp, Beauty and the Beast – and don’t forget America’s sweethearts, Mickey Mouse and Minnie Mouse. Throughout the 40-square-mile playground, love is in the air at the Vacation Kingdom. During a couples spa experience. In the middle of a romantic dinner. Or on one of the “love boats” that cruise Walt Disney World waterways. Honeymooners thrive in the romantic allure of Walt Disney World Resort – a top-rated honeymoon destination, according to industry experts. And for couples who want to make their own fairy tale dream come true – complete with Cinderella’s coach and her famous glass slipper – Disney’s Fairy Tale Weddings can create a happily-ever-after moment. For more information on Disney’s Fairy Tale Weddings, call 321/939-4623 or visit disneyweddings.com. Couples who are tying the knot back home can arrange a Disney’s Fairy Tale Honeymoon by calling 321/939-4623 or visiting the website at disneyhoneymoons.com. Make like Aladdin and Jasmine – fly through the sky with your loved one on an adventurous tandem parasail over Bay Lake. Those looking to soar to new heights can spend 10 minutes alone soaring high above Disney and get a bird’s-eye view of Magic Kingdom and its neighboring resorts. Contact Sammy Duvall’s Watersports Centre at Disney’s Contemporary Resort, or call 407/939-0754 for reservations for a tandem flight. Sunset in the Sky – A very different kind of flight is aboard a tethered balloon rising gently into the Florida sky. Located on the waterfront at Downtown Disney, Characters in Flight gives romantics a chance to take their love to new heights. Operating daily (weather permitting), the giant balloon provides breathtaking sights from 400 ft. up in the air with an unparalleled, 360-degree view of the Vacation Kingdom and beyond. Flights take place between 8:30 a.m. and midnight and last approximately 8-10 minutes. Romantics who time their flight to sunset or fireworks bursting above the parks are in for a special treat. Tickets can be purchased at Downtown Disney West Side. Magical Resorts – From the romance of an African lodge to the Victorian splendor of Disney’s Grand Floridian Resort & Spa, the mood is set for an enchanting stay at a Walt Disney World resort hotel. Disney’s fantasy hotels transport couples to faraway places with lavish theming, picturesque views and superior service. 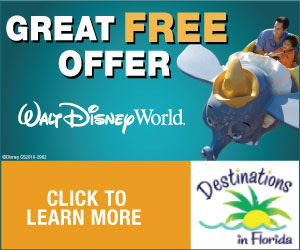 For reservations, call 407/W-DISNEY (934-7639). The Love Boat - The Grand Floridian’s Grand 1 – an elegant 52-foot yacht – can give couples, or parties up to 18, a stunning view of “Wishes” fireworks showering above Magic Kingdom during select evening cruises along Seven Seas Lagoon and Bay Lake. Private butler service and gourmet meals also are available. Romantic evening cruises include a captain and private deck hand. Reservations may be made up to 90 days in advance by calling 407/WDW-PLAY. Whether it’s an elegant ball at Disney’s Grand Floridian Resort & Spa, a traditional ceremony at Disney’s Wedding Pavilion or a beach-themed wedding complete with tiki torches, leis and luau on one of the Walt Disney World white-sand beaches, Disney custom designs each wedding with the famous “Disney Difference” – providing attention to the tiniest detail.